Today’s workplace is a global one, with companies and even teams that stretch across geographical boundaries. Distance is no longer a barrier to collaboration, thanks to technologies that allow for instantaneous communication across state and country borders. The idea of supervising and working with employees you rarely meet in person — if at all — is more and more commonplace. According to Gallup, 37% of US workers say they have telecommuted, a massive increase from the 9% who said the same back in 1995. Employment site FlexJobs saw a 26% jump in remote work postings between 2013 and 2014. It’s safe to say that, even if your company does not currently employ remote workers at the moment, you’re likely to hire or work with them soon. If that worries you — or if you already have remote employees and are concerned about them — it might be because of the stereotypes that run rampant about telecommuters being lazy, unreliable, or disconnected from the rest of the company. But the reality is that remote workers have a lot of potential to contribute to their organizations in unique ways. We surveyed 509 US employees who work remotely at all times to find out about their experiences in the workplace. And to put their responses in context, we compared them with benchmarks calculated from responses from over 200,000 employees across all work arrangements. 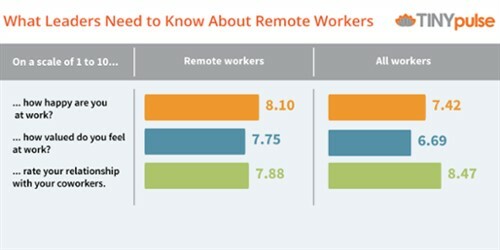 What does the remote workforce look like? From the 58% of employees who work on an all-remote team to the 51% who don’t work a typical nine-to-five schedule, this group looks very different from a traditional workforce. What are the best ways to get the most out of them? An overwhelming 91% of respondents say they’re more productive when working remotely. To maximize that productivity, we need to see what factors are helping or hampering their work. How strong are their relationships with supervisors and colleagues?27% of remote workers say they have experienced a work-related problem because they weren’t in the same place as their team. We need to take measures to mitigate these issues. What impact does experience have? Not all remote workers are created equal. We found significant differences between respondents based on their tenure at their remote job. Those who have been telecommuting between 6 and 10 years report being 11% happier than those in their first year. The insights provided to us by these workers can act as a guide map for leaders to figure out best practices for managing their remote employees — or leaders who want to start preparing for them. Want to learn more about how to keep remote employees engaged? Click the button below to download our report.